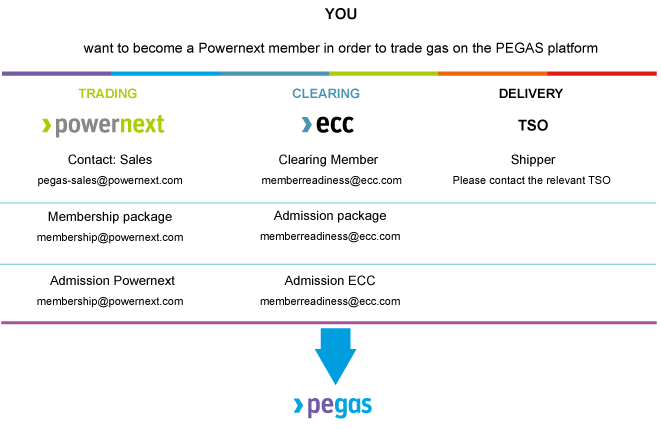 Becoming a Powernext member will allow you to trade on PEGAS, its natural gas trading platform. All Market Participants must conform with the Powernext Market Rules for Commodities (Spot and OTF) and/or Derivatives.You can find the latest versions in our website in the Download Center section of our website. In order to start the admission process at Powernext, you must first contact our Sales department. The relevant contact details can be found in the Contact section of our website. All applicants must conform with the Clearing Conditions and all additional rules and regulations in order to become a member. ECC clearing conditions can be found at the ECC website. In parallel to the admission process of ECC, you should initiate the admission process for the respective Delivery Organization(s). All trading participants opting for physical settlement are required to have a balancing area agreement with the relevant TSO. Alternatively, a third-party agreement with a member possessing such an agreement permitting access to a balancing area can be concluded. The list of Delivery Organizations is presented in Powernext Market Notices. More information can also be found under the access to ECC.